Class: ICETRA (Icelandic Transport Authority) – Previously DNV. Ice: The vessel is fit to operate in ice conditions – Ice strengthened. Electrical generator: 1 x To couple in when cruising then Aux engines does not have to run. Fire extinguish sys. : CO² in engine-room – Water sprinklers in passenger areas. The vessel is fitted with strong Rubber push buffer on bow. Very large outside area on two decks for passengers. 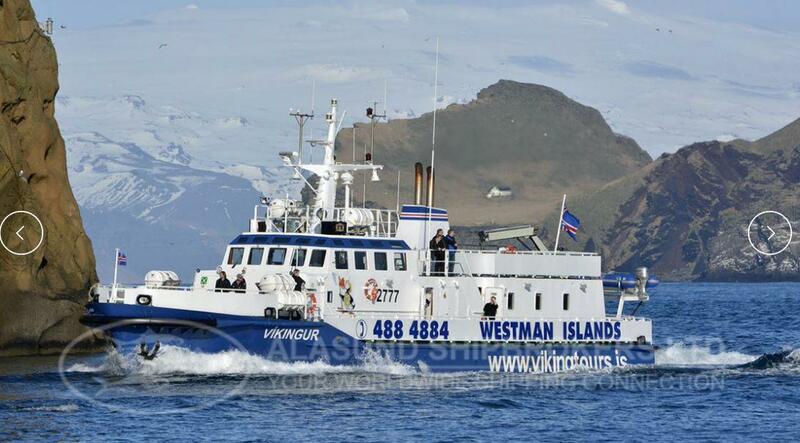 license in Iceland, meaning the vessel has much larger allowed distance of operation. The vessel has 4 watertight transverse bulkheads thereof one newly installed with remotely operated watertight door. Photos taken during dry-dock in July 2015. Both propellers are being serviced and all bottom surveys being conducted, etc. All particulars are believed to be correct, but given without guarantee for accuracy. Subject to prior sale and price change without further notice. Please call +(354) 421-6318 or you can fill out the form below and we will get back to you shortly.